According to several reports out Tuesday, Turkey's President Recep Tayyip Erdoğan said the decision would cross a "red line" for Muslims. Turkey's president threatened to sever diplomatic ties with Israel if President Donald Trump recognizes Jerusalem as the Israeli capital. According to several reports out Tuesday, Recep Tayyip Erdoğan said the decision would cross a "red line" for Muslims. Several countries have urged the U.S. to reconsider recognizing Jerusalem as Israel's capital city. 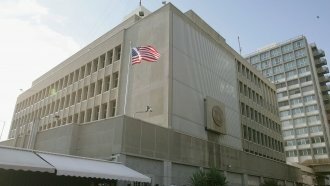 We previously reported the change could prompt Trump to move the U.S. Embassy in Israel from Tel Aviv to Jerusalem. But Palestinians also claim Jerusalem as the capital of what they hope will be their own sovereign state. Arab leaders warn recognizing Jerusalem as Israel's capital — and only Israel's capital — would engulf the region in violence.